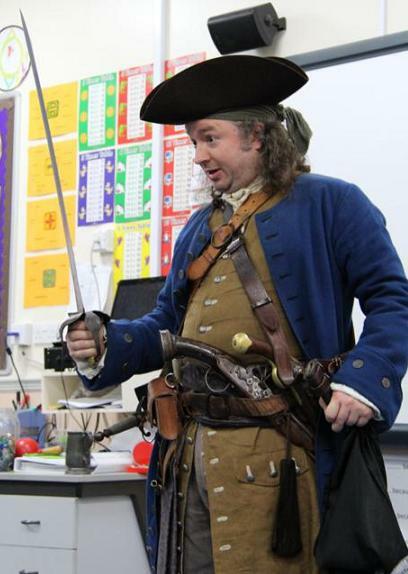 Captain Burwash visited a lot of schools this week, but on Friday things took a decidedly dramatic turn! As the good captain was waxing lyrical about his adventures upon the high seas he thought he heard one brave (foolhardy?) lad say his nose was big. Being a proud sort of fellow, the captain looked the lad over and told the lad that his feet were big. Of course, the class teacher could not allow such an argument to continue, lest it turned into a right rumbullion amongst all in the room. Thus it was that a pistol duel was fought – in the modern manner of Caribbean pirates – between the brave captain and said lad. Here you can see the very moment the two desperate contenders stood back to back, about to take their paces, and so determine once and for all who was in the right. Happily, they both survived and decided to let the matter settle. 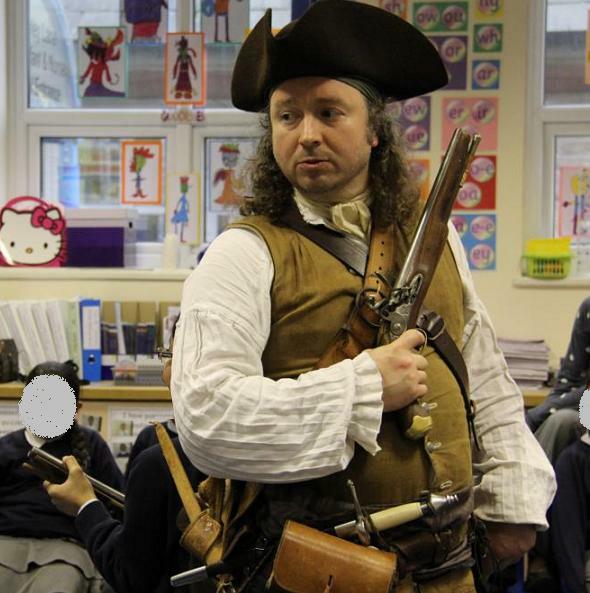 Captain Burwash resumed his tales of privateers and ‘skullduggerers’, fielding a veritable torrent of questions, from what he ate aboard his ship to how heavy his musket was, from how he became a pirate to what his favourite colour was(! ).